After locking up his first Giro d'Italia victory yesterday, Danilo Di Luca announced he will skip the Tour de France and try to peak again for late season races, including the World Championships in Germany. 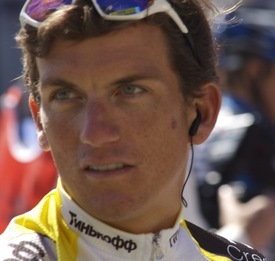 “I won the season-long ProTour in 2005 and now it's an objective again this year. This is my first Giro victory but I want to continue winning to make 2007 the best season of my career,” he said. The plan looks to leave Liquigas without a GC contender for the Tour: Manuel Beltran is their rider with the highest Tour placing, when he was 13th back in 2003, riding for Lance Armstrong's Discovery Channel. Triki also has 2 top 10s at the Vuelta, including last year, when he was 9th. Look for Liquigas to instead seek out opportunistic breaks for Filippo Pozzato, Luca Paolini, Magnus Backstedt, and Franco Pellizotti, depending on who winds up on their Tour squad. T-Mobile announced that Sergei Honchar will not start the Giro. Honchar, who led the race briefly last year, and was 2nd overall in 2004, is recovering from a cold or tendinitis, depending on your source. Honchar's illness opens the door for Michael Barry, who takes his spot on the start line. It also changes the team's focus to stage wins from TT specialists Marco Pinotti and Frantisek Rabon or from new sprint specialist Greg Henderson of New Zealand, starting his first Grand Tour. Also starting for T-Mobile is the USA's own Aaron Olson. Later today, Giro d'Italia organizers should announce the four wildcard teams for this year's race. DailyPeloton.com offers their analysis of the 7 squads vying for those 4 spots: Astaña, Tinkoff, Serramenti PVC, Panaria Navigare, Acqua & Sapone, Unibet.com, and Barloworld. That's the order the DP staff puts the teams' chances. I'm going to go out on a limb, and pick Unibet.com to make the Giro alongside three favorites Astaña, Tinkoff, and Serramenti. That would be a gesture of goodwill by the GT organizers and could kickstart discussions between the UCI and the tour promoters. Then again, I thought American voters would see through the Bush administration in '04, so what do I know?